In November, 2018, Colorado joined 12 other states and the District of Columbia in adopting the California Low-Emission Vehicle (LEV) standards. The standards require the average real-world fuel economy of new vehicles to reach 36 mpg by 2025. Currently, the California LEV standards are identical to federal standards, but the Trump Administration is attempting to rollback the federal fuel efficiency standards and freeze the requirements in 2020, which will increase both pollution and fuel costs in those states without the California LEV standards. By adopting the California LEV standards, a typical Colorado household will save $2,700 in gasoline costs by 2030, which amounts to $2.9 billion in total savings for the state. The standards will also improve local air quality and slow the upsurge of carbon pollution from the transportation sector, which is on the rise because of low gasoline prices and a trend toward larger, less fuel efficient vehicles. SWEEP strongly advocated for Colorado to adopt the standards and worked closely with Governor John Hickenlooper, who issued an executive order in June to initiate the rule-making. In November, the Air Quality Control Commission (AQCC) voted unanimously to adopt the California LEV standards. This proactive leadership saves Coloradans money and supports Colorado’s climate goals. Transportation electrification has also emerged as a key climate strategy for the transportation sector, which as of 2017, had surpassed the electricity sector as the largest source of greenhouse gas (GHG) emissions in the U.S. As the two energy sectors continue to diverge on GHG emissions, plug-in electric vehicles (EVs) offer an opportunity for the transportation sector to both decarbonize and cut local air pollution. SWEEP and Western Resource Advocates recently published an Arizona Electric Vehicle Cost-Benefit Analysis, which analyzes the economic benefits of broad EV adoption. 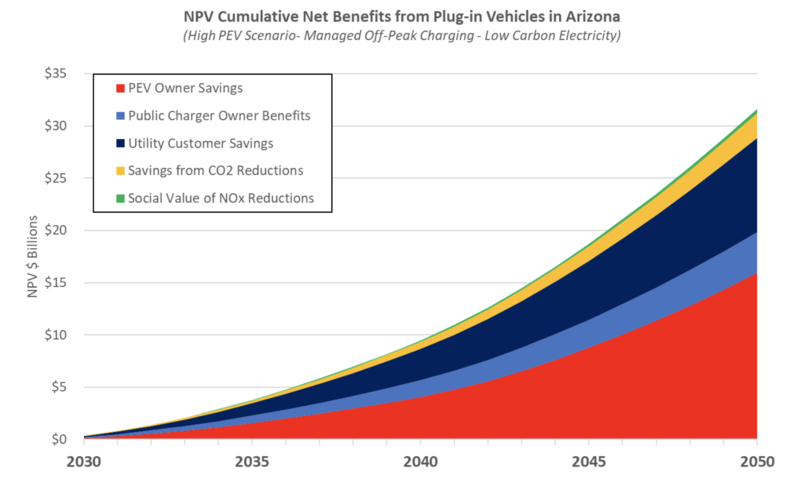 In a high-growth EV scenario with one million EVs on Arizona’s roads by 2030 and seven million by 2050, the cumulative economic benefits could reach as much as $31 billion by 2050 (see chart). This includes significant fuel cost savings for EV drivers, who spend the equivalent of about $1 per gallon on electricity to fuel their EV rather than $2.70 per gallon for a conventional vehicle. The economic benefits also take credit for improved electric grid utilization from EVs charging during off-peak hours, thereby spreading the fixed costs for the electric grid over increased electricity sales. This reduces electric bills for all consumers by almost $180 per year, shown in aggregate as utility customer savings in the chart. SWEEP is working with EV advocates and state governments around the Southwest to advance policies and programs that accelerate EV adoption so that our region can realize the full economic and emissions benefits sooner rather than later. Such policies include purchase incentives for EVs, requirements for utility investment in charging infrastructure, state funding for EV charging stations, and the adoption of EV deployment targets like the California Zero-Emission Vehicle (ZEV) standards. In 2019, the Colorado AQCC will initiate a separate rulemaking to consider adoption of California’s Zero-Emission Vehicle (ZEV) standards, which would require automakers to sell a certain number of EVs in Colorado each year. The California ZEV standards have been adopted by nine other states, and by increasing EV model availability and marketing, are one of the most effective state policies to support transportation electrification. Adopting the ZEV standard will help Colorado achieve its goal of 940,000 EVs on the road by 2030. To further support EV adoption, many states across the Southwest are using VW settlement funds to expand EV charging infrastructure. In Colorado, the state’s energy office recently awarded a $10.33 million grant to build a network of 33 fast-charging stations on the state’s major transportation corridors by the end of 2019. In Nevada, NV Energy, launched a $15 million EV infrastructure pilot program, which includes financial incentives for EV charging stations as well as discounted electricity rates to customers who charge their EVs during off-peak demand periods. There are also opportunities for local governments to achieve their climate goals by supporting transportation electrification. 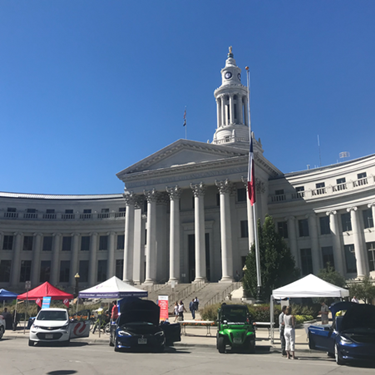 In Colorado, SWEEP co-founded the GoEV City campaign, which is encouraging commitments from local governments to set bold EV adoption goals and develop the necessary policies and programs to reach those goals. A model GoEV Resolution establishes electrification targets for municipal fleets, public transit buses, schools buses, taxis and TNCs (Uber and Lyft), and all vehicles in the community. SWEEP also created a GoEV City website with a policy toolkit to advance EV adoption, including EV-Ready building codes and EV group buy programs. In November 2018, Boulder County officially adopted a GoEV Resolution, and the campaign is looking forward to GoEV commitments from other local governments in 2019.